Lately I've been in a little bit of a funk. It's become this weird cycle of wanting to do one million things at once, overwhelming myself with planning, and nothing really getting done. Painting my nails is one of the few things I managed to do outside of work last week. No super cute designs either because I've dropped not one but two of my nail art brushes AND a dotting tool in my gallon container of acetone! Pitiful. Solid colors, tape, and half brushed nails are where it's at until I find replacements. Itching to see something through to its completion quickly (other than food/nails), I decided to hop on a trend a bit late and start making friendship bracelets again. For the first time since I got this Klutz book in '96! Having tons of embroidery floss and stacks of books laying around definitely helped. They're such simple, low commitment projects and you finish in no time. I finished this one before Andrew even uploaded the photo to flickr. There are tons of super awesome and involved free patterns online but right now I'm obsessed with hearts. I've made a few for my BFF (not just for myself, I promise), too. 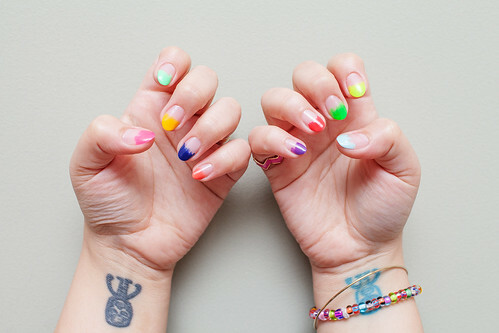 I love your nails, and that bracelet is coming pretty good:) Aren't they super easy to make? So easy! I got a little ahead of myself trying to follow a more complicated pattern, I think I'll stick with hearts for now. aw dang, katie and i tried to make friendship bracelets last summer and we both failed miserably! share your secrets! :O) maybe we needed awesome nails first? Aw, I suggest you start with easy patterns like stripes, and stick with small amount of string and colors so you don't confuse yourself. If you click on that link up there, there are tons of easy patterns posted. Good luck! Cute nails always help, too! best of luck! give it a try. These bracelets are what made middle school fun for my girls !! I am your newer follower..pls follow back if you can . I love the detailed instruction photos, thank you! I think my 4-year-old would love to pick a few colors and make one of these!